John Houston’s Sweet Providence Farm Market & Bakery in Floyd, Virginia, offers fine live music along with locally raised meats and produce. Martin Scudder and Bernie Coveney entertained a group of fans yesterday on the timber frame verandah overlooking Route 221 far below. Martin’s red violin sounds like no other and makes a perfect counterpart to Bernie’s inspired guitar stylings. Bernie has recently recorded his new CD, Whispering Pines and Martin had copies of his new CD on hand, Chapter IX Stepping Forward. Rumor has it that they are recording a new CD together. It should be quite popular. Bernie and Martin are pros and they make great music. 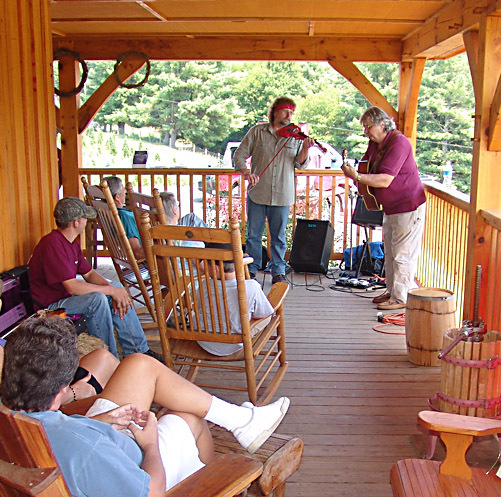 Sweet Providence Farm is presenting live music every Saturday afternoon all through the summer. Check their website for a schedule of performers. This entry was posted in Music, Seen around Floyd and tagged Bernie Coveney, Floyd Virginia, Martin Scudder, Sweet Providence Farm. Bookmark the permalink. yours was the first blog i ever read from floyd, and i was a bit mesmerized with the “floyd way of living” from the very beginning. i ran across colleen redman’s blog later and began to keep up with much of the floyd “goings on.” i have never encountered a community lifestyle like the one you guys live. it fascinates me! what a joyful way to live in community with your neighbors – so much mutual support and recreation, a sense of belonging to the “whole.” one day we are determined to visit and see this magical place for ourselves.